A motorcyclist was killed in a collision with a vehicle at a Vista intersection. The accident occurred around 6:00 p.m. Sunday at the intersection of Specialty Drive and Poinsettia Avenue. The 30-year-old man riding the motorcycle was pronounced dead at the scene, Gonzalez said. His name was withheld pending family notification. The driver of the other vehicle, a man believed to be in his 50s, and his wife were uninjured in the crash and stayed at the scene, it’s believed that intoxication was not believed to have been a factor in the crash. 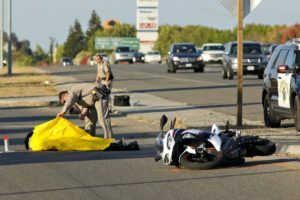 The San Diego motorcycle accident lawyers here at RiderzLaw offer our deepest, most sincere condolences to the family and friends of the rider affected by this tragedy. We beg all our readers to please, stay safe and look out for yourselves and others while on the roadways. 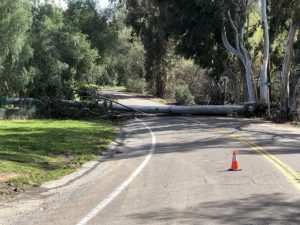 After the past few weeks of rain and some high winds, trees in FallBrook, Ca have been toppled over causing road blocks and some serious injuries to a fellow Motorcyclist. It was around 2:00pm, when a motorcyclist was riding near West Elder Street and South Mission Road got struck by a fallen tree causing serious injuries. The rider was airlifted to Palomar Hospital for treatment. There was 2 other incidents with reports of fallen trees in North County. The San Diego Motorcycle Lawyers wish the Rider and speedy recovery and hope he is back on twos fast. The Morning of March 5th, on a busy intersection in La Jolla, a 32-year-old man was hit by an SUV. The Motorcyclist was riding his 1999 Triumph to the north alongside a sidewalk in the bicycle lane passing slower moving traffic when the Toyota Highlander turned into a driveway directly in his path. Medics took him to Scripps Memorial Hospital in La Jolla, where he was pronounced dead. It’s always important to stay alert during morning commutes no matter how familiar the road is. When lane splitting and in heavy traffic its always best to make sure you have your fingers over your break lever and foot over the rear break for faster reaction times. Our hearts go out to this fallen rider and his family. The San Diego Motorcyclist Lawyers at RiderzLaw remind everyone to stay safe and ride responsibly. September 19, 2013 One of our servicemen has been killed in a motorcycle crash on the Interstate-15 near the ramp for the Interstate-8, according to the California Highway Patrol. Robert Michael Campbell of El Cajon was riding his Suzuki when he rear-ended an Acura slowing for traffic. According to the Medical Examiner’s Office, Campbell was taken to the hospital, but succumbed to his injuries in the Emergency Room. Campbell is survived by his wife. No details as to his position in the military were released. Often times during approaching traffic, the abrupt slowing of vehicles can cause huge issues for motorcycle riders who are caught off-guard. Being forced to split their attention amongst so many different tasks, the unpredictability of road conditions can leave riders heading into unavoidable situations. Our deepest condolences go out to the fallen rider, his wife and all those whom will be affected by this accident. Please stay safe on the roadways riders. 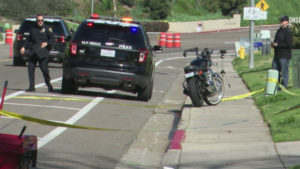 San Diego Medical Examiner Officials have identified a man killed in a Pacific Beach motorcycle accident last Sunday. The victim,39-year-old Matthew J. Dunn, was traveling west on Garnet Avenue riding his 1999 Ducati. According to officials, at approximately 3:35 pm, an Acura TSX turned left in front of him, near Bond Street. Dunn was unable to avoid collision with the vehicle. He was taken to the hospital and pronounced dead at 4:17 pm from blunt force trauma. The incident is under investigation by the San Diego police. It’s common knowledge among riders, that the greatest danger posed to us on the road is by the cagers we share them with. It happens that often times we can become invisible to drivers, exacerbated by apathy on their behalf towards riders. Unfortunately for Matthew Dunn, he was the victim of exactly this situation. The San Diego motorcycle accident lawyers here at RiderzLaw offer our deepest condolences to those affected by this tragedy. A 43 year-old Imperial Beach rider was killed in a single vehicle accident on Friday. It appears that at approximately 6:15 am while exiting the I-5 at E Street, the rider took the turn faster than his 2008 CBR1000 could handle. The rider, identified as Darnell Adams, was thrown from his bike following collision, and would not survive his injuries. According to the San Diego Coroner’s Examiner, Darnell was a widowed man living with his family. Most of us can empathize with what occurred here. Early in the morning, maybe headed to work, we’re not exactly on our ‘A’ game. Usually we catch ourselves but sometimes our environment has a way of catching up with us and in this case the result was a loss of life. The San Diego Accident Lawyers here at RiderzLaw wish the best for the family of Darnell during this time, and remind our readers to always ride beneath the limitations of their equipment.